An adventure for 3rd-5th level characters to get their teeth into. Publisher's blurb: "Two baffling murders rock the city. Both victims were members of the powerful Marciano mob, but in each case, the murderer was a random citizen with no connections to the victim or the criminal word -- a random citizen who immediately kills himself after the deed is done. "What could be the motive behind these murders? Who is turning the innocent into cold-blooded killers? 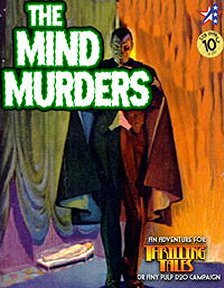 Can anything stop the Mind Murders?"